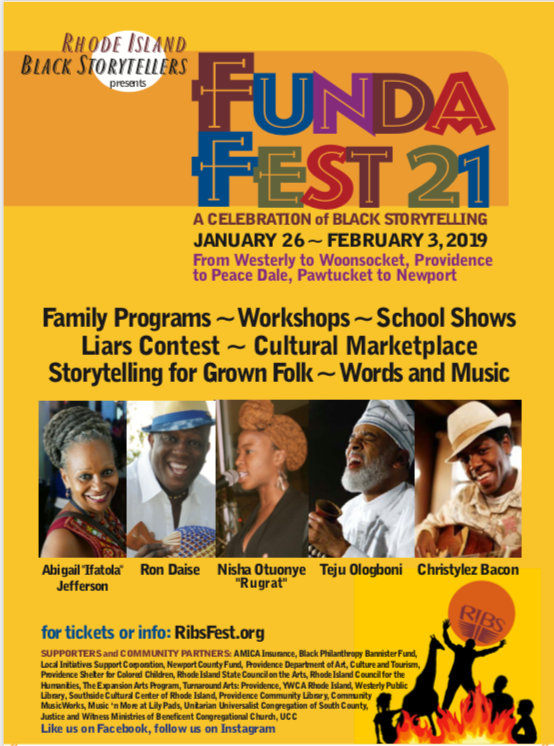 This much anticipated and highly visible event is the flagship of Rhode Island Black Storytellers (RIBS) program and reaches a statewide audiences of thousands. Each January for the week of the Martin Luther King Holiday, RIBS tellers, local artists and invited national and international guests bring the best of Black Storytelling to Rhode Island and Southern New England. For an entire week, Rhode Island will experience some of the best cultural arts programming across the state for the 20th year in a row. The Rhode Island Black Storytellers mission is to promote the awareness, appreciation and application of Black Storytelling through performances, workshops, cultural, educational and historical experiences for all people. RIBS defines Black Storytelling as the oral art and traditions of African and African descended peoples worldwide. FUNDAFEST 21 is made possible by the Rhode Island State Council on the Arts, Providence Shelter for Colored Children, Providence Department of Art Culture and Tourism, Newport County Fund, YWCA.